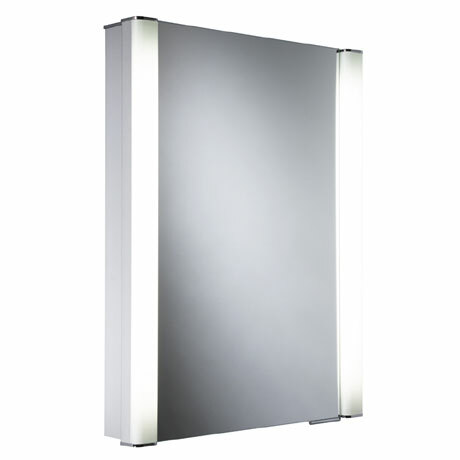 The Illusion Recessible Illuminated Mirror Cabinet is a stunning aluminium cabinet that can be recessed into the wall for those wanting a more contemporary and sleek look. Offering ample storage space, it also features double sided mirror door that is soft closing with square profiled fluorescent lights either side. A shaver socket is built in for charging toothbrushes and shavers and an infrared no touch on/off switch operates the lighting. The cabinets quality construction is reflected in the 6mm laminated safety mirror glass, door seals on all edges and adjustable glass shelves. Mirror cabinets provide a great alternative to a mirror when you need additional storage space.